Sigur Rós blew minds Saturday with a celestial live performance at the Hollywood Bowl. Blew. Minds. I had never seen the Icelandic group in person, only ever having been deeply mesmerized by their recorded work. 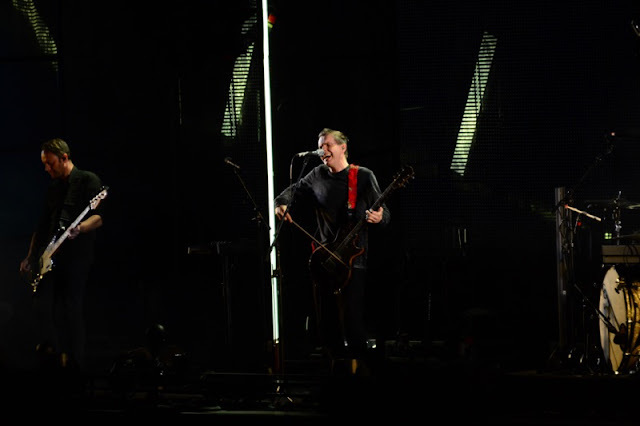 I wondered how it would translate to a live show, and the answer is awesomely. We had to yet again endure awful getting to the Bowl traffic, thus missing (though we left early) almost all of the openers, The International Space Orchestra. Their name alone set the tone, and as I walked in and heard the total chaos of this group comprised of NASA scientists, I kind of did think I was another planet. There was a lot of banging and screaming and feedback and mayhem and now I need to see them again to get what it’s all about. The neighboring box tenants told me it was great, if “Experimental” sounding. OK. Again, it did set the tone for anything goes. The audience mixed and mingled as ominous chords rang out, until suddenly the lights went down and the sold out crowd roar went up. 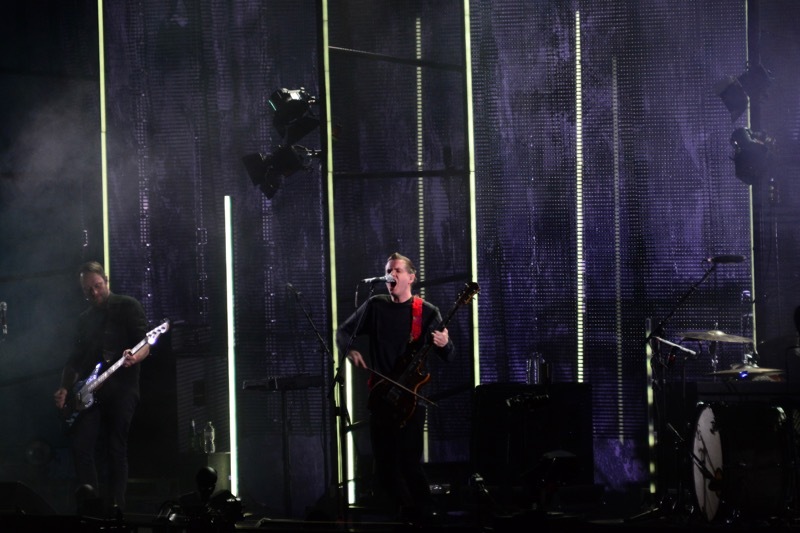 Sigur Rós took the very dark stage and immediately entranced the entire venue playing their opening number, “Á”. 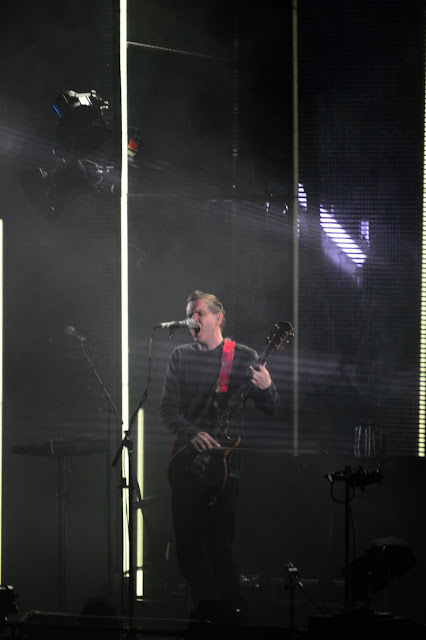 Singer Jón “(Jónsi!) Thór Birgisson’s otherworldly vocals spiraled up into the atmosphere, and we had achieved lift-off. 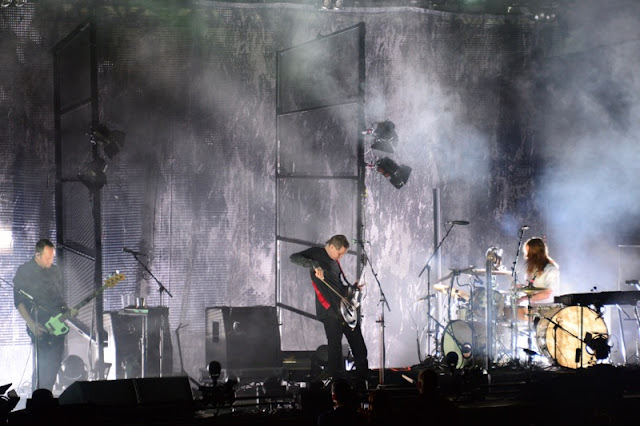 Sigur Rós (there sure are a lot of accents in Icelandic typing!) are entirely original (much like their fellow countrywoman, Björk – what is in those frigid waters?! ), as the lyrics are sung in their own language, so even though you truly have no idea what is being sung, you listen just as carefully somehow. This band is a prime example of how absolutely Universal music is. Even in other galaxies, I presume. There was a video screen backdrop depicting trippy visuals and stark natural landscapes that beautifully illustrated what must have been being sung. 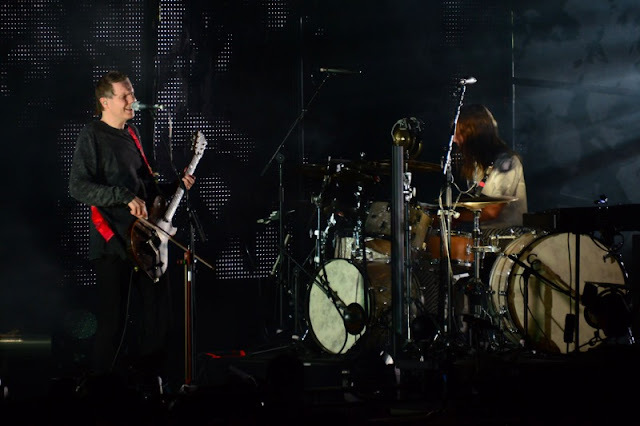 As the band (bassist Georg Hólm and drummer Orri Páll Dyrason) soared into “Ekki Mukk”, “Samskeyti”, “E-bow”, “Daudalagid”, “Glósóli” and “Smaskifa” (I had the set list for help with that), the music was so atmospheric and surreal, you could look around and see that everyone was rapt, and deeply entranced. The guy behind me (who had a lot to say the whole time) said, “This is like my Xanax.” I get it. It was so slow, so deeply beautiful, a real sense of calm came over you, like indeed a musical opiate. The bowed guitar also served to create a unique sound that was part rock/part orchestral/all cool. Birgisson’s voice is boys choir high at times, and as he sings with his eyes closed, I thought he kind of resembled Shepard Fairey a bit, but really, he didn’t seem from this planet … or rather, maybe it’s that he’s totally OF this planet … like, he might get it all better than we do. I don’t know … but I can tell you he led the entire Hollywood Bowl audience through what felt just like a massive group meditation. With wine and cheese. There was a needed intermission then, which helped to process it all. This is a band credited with Iceland’s “Best album of the Century”, yet it’s almost impossible to describe. It’s just special, and one felt united with everyone there experiencing the same beautiful thing together. Wow. Just wow. All of the songs are extra cinematic, made for soundtracks, and have been used in them many times. Though there was so much to see with the visuals on stage, it was also great to just close your eyes and make up your own scenery in your mind in a fully public escape. It was greatness. … All of which were stunning. It was a super warm night in Hollywood, and as the California Republic flag fluttered in the occasional welcome breeze, and the cross was lit up behind it on the mountain … it really did feel holy. The sounds created seemed produced and distorted at times, but it was all live. And trippy. And wonderful. Everything sounded so full and lush with just the three players that now I’m all hyper and intrigued to see them play next April at Disney Hall with the fantastic L.A. Philharmonic. Now THAT promises to be something else. 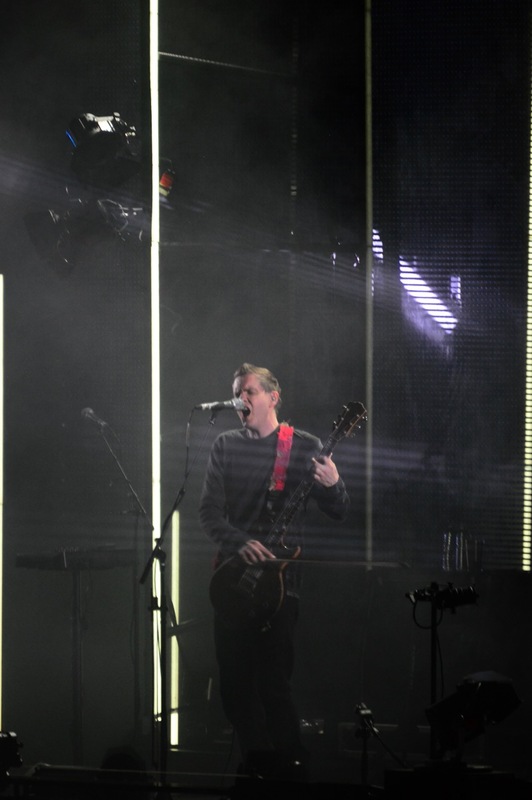 “Love you Jónsi, you Badass!” that guy behind me yelled, while his box mate yelled, “More light magic!” Though annoying, I agreed wholeheartedly with them both. It’s kind of a modern miracle that music like this will sell out the Bowl and leave modern audiences so entranced. This is not remotely mainstream pop, yet there are some artists (often Icelandic) that can do whatever they want, and people will not only listen, but adore it. Birgisson’s voice went up to a dog’s level of hearing on his last held note, and the resulting screams from fans and feedback from instruments as the band left the stage made me think the International Space Orchestra had returned. They had not, it was just rapturous applause for a rapturous show. There was no encore, and none was needed. The video screen came up with the word “Takk” (Thanks in Scandinavian languages), and I think that’s what we all felt. Simply thankful for being there, and sharing in that universal musical embrace. If you get the chance to see Sigur Rós near you … take it.